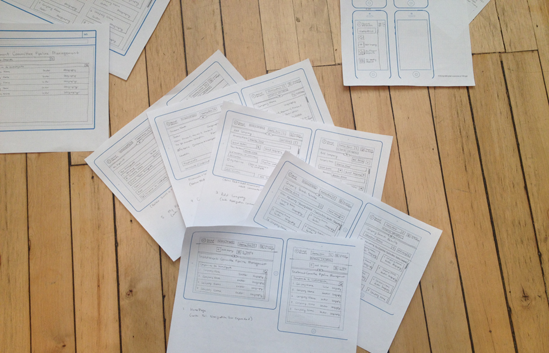 From the look & feel to the strategic plan for how the user will interact with the system. A successful interface combines visuals, content and function in a way that communicates, engages and facilitates. The initial design starts with the mobile design, then determining where additional elements can or should be added to the larger spaces like tablets and desktops. Additional elements could be supplementary content; such as the amount of details included in previews, or optional interactions; such as rollover states for images or text. 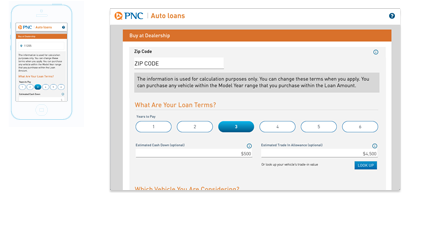 The Online Auto Loan Application enables customer to research financing options, apply for a loan and get it approved faster. 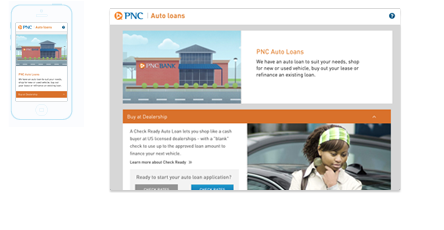 The responsive AEM (Adobe Experience Manager) site has an integrated companion experience for PNC Mobile. A Custom UI was developed to fit the needs for the Upper Management at a Global Equity Investment Firm. The primary function of the app is to provide a direct access to the specific data housed in the standard Saleforce platform. The design utilized components from the recently released Lightning Design System to allow for quick development and backend integration. Mobile design allows user access to information and to engage in activities on the go. Design for each device is driven by the context with which the user interacts with it. Apps can enrich the user experience by information automatically by incorporating data from the users calendar, contacts, geo location or even heart rate. 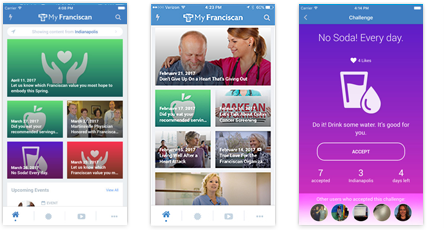 The mobile app was developed to offer Franciscan Alliance employees fun ways to engage through health & wellness challenges, earning participation perks, and viewing value-based encouraging messages. 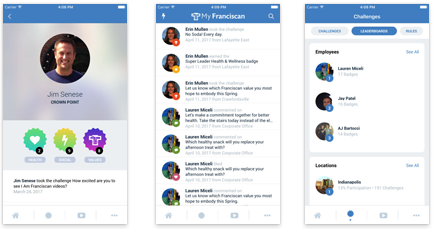 Employees can see their colleagues' activity, encorage others by commenting on challenges and share their experiences. The app broadcasts location specific events, and news throughout the Franciscan Alliance community. Those that allow the app access to their Bluetooth will get notifications for hotspot challenges. The visual design for the task flow for the challenges in the game-like Apple Watch fitness app had to meet specific standards of the Apple Watch Human Interface Guidelines, as well as integrate the Nintendo characters. Tools to enhance online presence including websites, subsites, landing pages, HTML emails, online applications. Whether the goal is engagement, ecommerce, connecting a community or content presentation, the user interface creates the first impression for users. 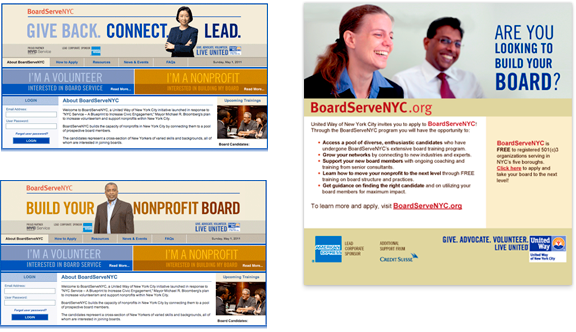 The sub site was created as part of an initiative to links nonprofit organizations with experienced volunteers as a part of NYC Service, Mayor Bloomberg's plan to increase civic engagement, volunteerism and support nonprofits within New York City. Nonprofit organization looking to strengthening their boards. Candidates looking to join a board and receive training in nonprofit governance. The sub site was created to serve as the central hub for the campaign to raise awareness of Goya Foods' 75 anniversary, their community envelovement and their commitment to providing nutritious, delicious and cost effective foods.